While wine making at Fombrauge dates back to the 15th century, the wines made back then, I can assure you, do not share any resemblance to the wines produced by the Bernard Magrez owned St. Emilion estate of Magrez Fombrauge today! The history of Magrez Fombrauge does not back nearly that far, in fact 2000 is the debut vintage for Magrez Fombrauge. 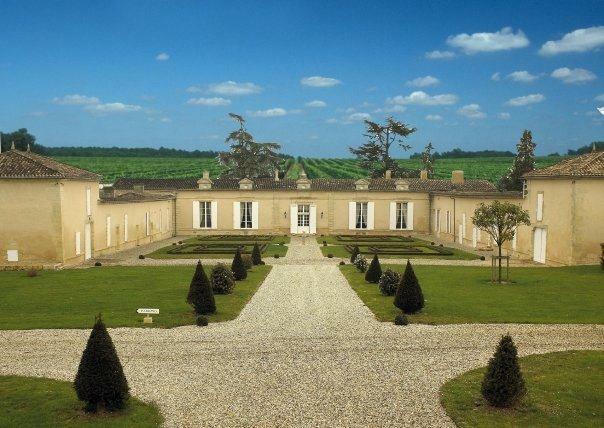 Bernard Magrez purchased the Saint Emilion estate back in 1999. One of the first moves Bernard Magrez made after buying Fombrauge was to hire the famous Bordeaux wine consultant, Michel Rolland. With a commitment from Michel Rolland, and the willingness, coupled with the ability to spend any amount of money to make the best wine possible at this Right Bank estate, they have done a lot with this unique terroir. All vineyard management techniques is self sustainable. At Chateau Magrez Fombrauge, horses are used to work the soil for the red wine grapes, exclusively. Chateau Magrez Fombrauge is a modern styled Bordeaux wine indeed. It is also powerful, deep, concentrated, rich and complex and in the top vintages, it demands 10-15 or maybe even 20 years to come around. The 3.5 hectare vineyard of Magrez Fombrauge is planted for red and white wine grapes. For the red wine, the vineyard is planted to 70% Merlot and 30% Cabernet Franc. Located on the Cotes of St. Emilion, the fruit source comes from a specific section of the much larger, vineyard of Chateau Fombrauge. Even though this is not a sizable block of vines, the roughly 3 hectares here are divided into 3 separate parcels of vines. The vines are old. The vines range in age from 60 to 70 years of age. Yields are kept low at the property. They can be close to 20 hectoliters per hectare. The terroir consists of chalk over limestone soil. Chateau Magrez Fombrauge produces a small amount of dry, white Bordeaux wine from a blend that is often close to 40% Semillon, 30% Sauvignon Blanc and 30% Sauvignon Gris. The terroir for the white wine is mostly limestone based soils. The wine was previously known as Chateau Fombrauge Blanc. That change took place with the 2001 vintage. Today, the wine is sold as Magrez Fombrauge Blanc. To produce the red wine of Magrez Fombrauge, the wine is made using micro vinification techniques, which calls for the grapes to be vinified in 100% new, French oak barrels. The barrels are small. Each barrel is 40 hectoliters in size. The grapes are hand destemmed and are whole berry fermented, meaning that the fruit is not crushed. Malolactic fermentation takes place in barrel. The wine of Magrez Fombrauge is aged in a combination of 100% new, French oak barrels and terracotta jars that range in size from 200 liters, up to 450 liters. Production of the red wine of Magrez Fombrauge is close to 350 cases of Bordeaux wine per year. To produce the white Bordeaux wine of Magrez Fombrauge, the grapes are vinified in new, French oak barrels. There is no malolactic fermentation or skin contact. The wine is aged on its lees. The blend is usually the same as what it planted in the vineyard, 40% Semillon, 30% Sauvignon Blanc and 30% Sauvignon Gris. In select vintages, there is a special, white Bordeaux wine produced called Sublime de Frombrauge, which is made from 100% Semillon. Chateau Magrez Fombrauge is better with at least 8-10 years of bottle age. Of course that can vary slightly, depending on the vintage. Chateau Magrez Fombrauge is best enjoyed in the first 8-30 years of life. Young vintages can be decanted for about 2 hours or so. This allows the wine to soften and open its perfume. Older vintages might need very little decanting, just enough to remove the sediment. Chateau Magrez Fombrauge is best served at 15.5 degrees Celsius, 60 degrees Fahrenheit. The cool, almost cellar temperature gives the wine more freshness and lift. Chateau Magrez Fombrauge is best paired with all types of classic meat dishes, veal, pork, beef, lamb, duck, game, roast chicken, roasted, braised and grilled dishes. Chateau Magrez Fombrauge is also good when matched with Asian dishes, hearty fish courses like tuna, mushrooms and pasta. Magrez Fombrauge Blanc is perfect when served with all types of seafood, shellfish, chicken, veal, pork and cheese. Starting with the 2010 vintage, Magrez Fombrauge began taking anti counterfeiting measures using the Intaglio method of bottle etching, coupled with Spottag, which adds an invisible ink to the labels. The modern style of Magrez Fombrauge is very ripe, intense, aromatic and powerful, with lush tannins and a long, mineral driven finish. Juicy, bright, crisp and fresh, this is loaded with lemons, pomelo, vanilla, honeysuckle and just a bit of tropical fruit. Refreshing and fruity with a nice pop of citrus on the palate, this will be great on release and better with a few years of age. Inky in color with licorice, black cherry, black raspberry and smoky notes on the nose, this wine is full-bodied, fleshy, round, soft and polished. There is freshness and volume on the palate along with a healthy dose of oak. This is not for drinking in its formative years, because when it all comes together, this will be a markedly better wine as the oak integrates. Inky and opaque, the wine is all about chocolate-covered boysenberry, espresso, licorice, dark plum and darker cherry. Velvet drenched tannins, fat, salacious, opulent layers of perfectly ready, glossy fruits. This is the best wine produced here since 2000. You can feel the difference. It seems like everything has truly been dialed back. Citrus, grapefruit, vanilla and honeysuckle notes give you a wine with richness, sweetness and a nutty flavor -- though a bit more acidity would be nice. Inky in color, the wine is full bodied, concentrated, rich, fat and round. There is a wealth of fruit, length, tannin and the structure to age. The finish keeps on going with its layers of of dark ripe fruits, licorice, chocolate and espresso. This is worth laying down for a decade before popping a cork. Using 70% Merlot and 30% Cabernet Franc, this wine is deeply colored, expressing smoke, licorice, black raspberries and plum jam. On the palate, the wine is lush, rich and concentrated, with opulent textures and a wealth of earthy, black cherries and sweet, boysenberry jam. The wine is powerful, fat and round, yet fresh and balanced. The wine is aging in a combination of 100% new, French oak barrels and terracotta jars that range in size from 200 liters, up to 450 liters. Using 40% Semillon, 30% Sauvignon Blanc and 30% Sauvignon Gris, this wine is already showing white peaches, citrus and honeysuckle notes. On the palate, the wine offers both rich textures and freshness, with a pure, sweet, citrus peel finish. Bright, crisp, biting yellow citrus fruits with a strong grapefruit, lime and green apple character that shows itself in the nose and on the palate. Medium bodied, with a ripe, dark cherry, smoke, espresso and earthy character, round textures and a fruity, smoky finish. Truffle, licorice, blackberry and cherry notes lead to a full bodied, ripe, juicy mouthful of fresh berries that is showing a bit too much oak at this stage. This needs at least 3-5 years in the in the cellar to integrate. Lemon, lime, grapefruit, stone and smoky notes are paired with fresh, citrus and pineapple and green apple to create a lively, fun, fresh, mineral driven, white Bordeaux wine..
Inky in color, the wine is rich, intense, polished and lush, with layers of dark, ripe berries, licorice, espresso, smoke, flowers and dark chocolate. While everything about this wine is intense, it’s also balanced, expressive, with a long, fresh, supple textured finish. Inky in color, the wine is noticeably oaky, with its strong coffee bean and vanilla character that at the moment, overpowers the licorice, black raspberry, blueberry, smoke, earth and jammy notes. Deep, rich, concentrated and palate staining, the wine feels plush, with no dryness. This needs time for the oak to integrate. From a typical blend of blend of 80% Merlot and 20% Cabernet Franc, this deeply colored wine opens with chocolate covered cherries, licorice, earth, stone and fresh blackberry aromas. Plush in style, and already open, this round, plummy, concentrated St. Emilion should deliver pleasure for at least another decade or 12-15 years, or longer. Licorice, minerality, cassis, espresso, cassis and black cherry scents are accompanied by a full bodied, concentrated wine that finishes with licorice, coffee, blackberry and cassis sensations. Showing maturity in the color, the wine is all about its truffle, smoke, earth, licorice, black plum and thyme infused character. Dense, rich and supple, the wine is full bodied, leaving you with cherries, plum and spicy sensations. Licorice, stone, blackberry jam and cocoa scents, full bodied and concentrated with ripe fruit, this tannic wine has broad shoulders and demands cellaring before it begins to come together. Give it another 5 years of sleep to develop. Licorice, stone, smoke, wet earth, plum and vanilla in the nose, the concentrated, sweet, fleshy, ripe, round, silky wine shows well today and is only going to get better with a few more years of age. Powerful, tannic, oaky, full bodied and intense, the wine is filled with sweet, ripe, jammy berries, licorice, boysenberry, espresso, some and earthy characteristics. Plush, rich and deep, the wine needs time for the tannins to soften and for the oak to better integrate with the wine. Deep in color, the wine is tight. With effort, black truffle, smoke, licorice, cigar box, plum and coffee bean scents open up. Full bodied, concentrated, tannic and still youthful, the wine is silky, powerful and long. This needs more time in the bottle before the oak becomes better integrated. This has matured far too rapidly. The nose of licorice, espresso bean, smoke, truffle, black cherry and jam is a treat, as are the supple textures, but the loss of fruit is worrisome. I’d drink this sooner than later. Deep, intense, rich, full bodied and opulent in texture, the wine is still a bit too dominated by oak, making it difficult for ripe, black cherries, licorice, crushed stone and spicy notes to get their due. This is a very modern style of Bordeaux that might be better if it were dialed back just a bit. Still deep in color, with a nose packed with licorice, coffee bean, chocolate, jammy plums and blackberry and earth, this hard to find St. Emilion is packed and stacked with massive layers of mouth filling, perfectly ripe and overripe berries, spice, earth, oak, cocoa and stone. Still young, 2000 Magrez Fombrauge has a lot of potential to become a stunning Bordeaux wine with another decade of bottle age. Inky in color, from the look of it, it could have been from 2005. Explosive in the nose, with smoke, licorice, coffee, black cherry, blueberry, barbecue, crushed stone and griotte notes, this massive, powerful, palate staining wine is dense, concentrated and intense. It borders on over the top, but somehow manages to keep everything in check. Still tannic and youthful, give it another decade and this blend of 78% Merlot and 22% Cabernet Franc should all come together. Packed and stacked with incredible layers of intense, ripe and over ripe black fruits, spice, coffee, licorice, oak and vanilla. This wine needs at least another decade before its port like style becomes civilized. This wine is not for everyone. But for lovers of intensity that are willing to take a chance on a unique style of wine, it's worth picking up a few bottles. This could score several points higher when fully mature.